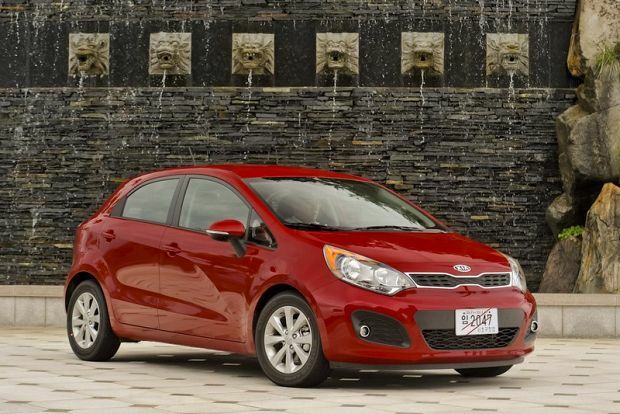 For 2012, the Kia Rio and Rio5 are completely redesigned, including new styling, revised interior and a new engine and transmissions. The Rio is available as a four-door sedan, or as a four-door hatchback called the Rio5. All models use a 1.6-litre direct-injection engine with six-speed manual or optional six-speed automatic. Features on the LX models include 15-inch steel wheels, cloth seats, six-way manual driver’s seat with height adjustment, 60/40 split-folding rear seatbacks, power locks, power windows, heated mirrors, variable intermittent wipers, CD/MP3 stereo with four speakers, auxiliary input and USB port, tilt steering wheel with audio controls, map lights, illuminated vanity mirrors, and front and rear mud guards. The hatchback also includes a rear washer/wiper and rear spoiler.